At the beginning of every new year, everyone sets out to declutter and clean out every room in the house. Worn-out kitchen utensils are tossed, the bathrooms are deep-cleaned, bedroom furniture gets feng shui treatment, and people’s closets are turned upside down, with tons of items stuffed into plastic bags and donated to charities in order make room for brand-new clothes. If you’re a girl like me, being stuck with a boring wardrobe is probably one of the biggest things that hinder that “new year, new me” feeling every January. 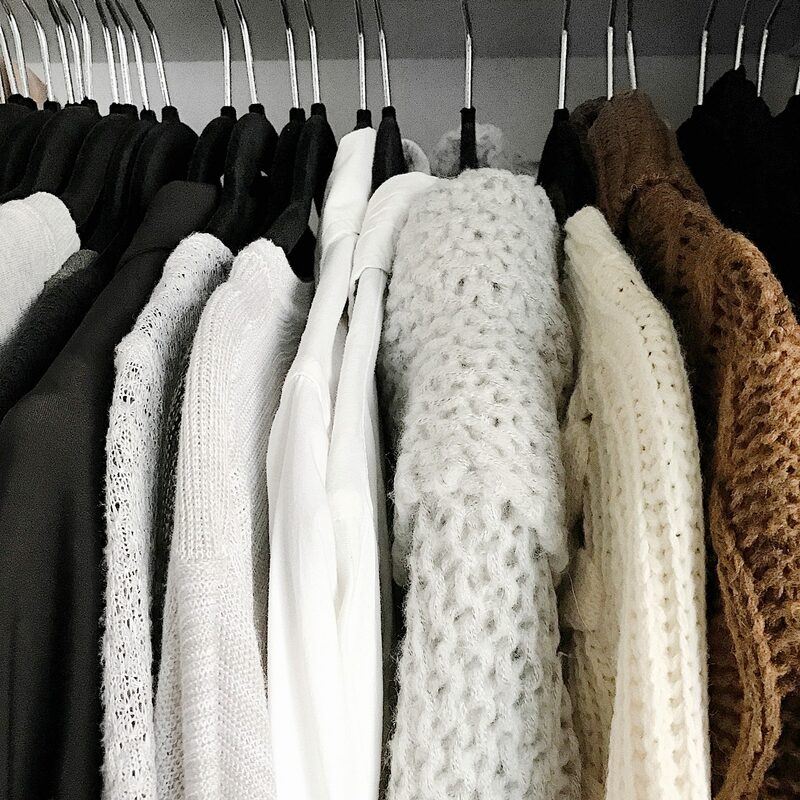 But you don’t have to toss out your entire closet and buy a new wardrobe every year to refresh your wardrobe – here are 10 budget-friendly ways to spice up your current wardrobe without breaking the bank. Sometimes having a neat and tidy closet is all you need to get inspired. Take the time to pull out all of the items in your closet, give it a nice dusting and vacuuming, and then organize your clothes. Depending on how you assemble your outfits, the best way to organize your clothing is either by color or style. Pro tip #1: Prevent clutter by packing away your off-season clothes in a box in the attic. Keep items you know you will use for the current season in your closet. Pro tip #2: Double your closet space by investing in space-saving velvet hangers. At first, these thin velvet hangers seem expensive and flimsy, but I can guarantee you that they really do free up a ton of space and are worth the investment – I have an expansive wardrobe in my 4-ft-wide closet thanks to these babies! Have a ton of boring denim that’s been taking up shelf space? Take a scissor, tweezer and a cheese grater to them and create loads of designer-inspired distressed denim instead of tossing them away. Check out my tutorial on 3 easy ways to make DIY distressed jeans. I know, I know – we all have that one pair of jeans or little black dress that we store away for the day we finally reach our goal weight – but let’s be honest here… it’s probably been sitting in your closet for years now, meaning you’ll probably never see the day you’ll be able to shimmy your way into them without busting open a seam. Besides, if ever you eventually do, you already know you’ll want to invest in nicer clothes as a reward for hitting the gym every day. Sometimes the problem isn’t with your clothes, but your entire look as a whole. Getting a fresh cut may very well fix the problem. Try out a long bob, a pixie cut, or an entirely different hairstyle from what you normally do. Who knows, a new ‘do might very well add the much-needed chic factor you were lacking without spending $100s on new clothing. Your accessory inventory might be a raging mess of tangled necklaces, missing earrings and linty hats, but it’s a treasure chest full of items that can spice up your outfits. Dust it off and reorganize it and see what pieces you can add to your outfits to get that extra oomph. I’ll be the first to admit that when you have an expansive wardrobe it can feel extremely overwhelming to coordinate outfits on the fly. My solution to this is to take the time to coordinate a stockpile of outfit photos you can flip through if you need some inspiration. When I’m bored, I’ll play dress-up in my own closet and style outfits and then take selfies in the mirror as a reference photo. These outfit photos get added into an album on my phone that I can look through when present Me needs styling tips from past Me. Every girl will say that their wardrobe is boring, but I bet you $20 that you have tons of unique key pieces that you can build a chic wardrobe around – you probably just don’t have the inspiration to style them. Find items in your closet you’d like to create outfits for and them search up the item on Pinterest + the word “outfit.” You’ll see a ton of outfit photos featuring your item. Voila, brand-new inspiration for you to bring life to your “boring” clothing! There are probably several awesome pieces in your wardrobe you avoid wearing because they may need a good cleaning or ironing – don’t be lazy and get it done. Soak your white T’s and other white clothing in Oxyclean and then bleach them in the washing machine. Wrinkled dress shirts and blazers? Take them to the dry cleaners or steam them to make them look brand-new. Use a toothbrush and toothpaste on dirty sneakers and wipe down your leather heels with a rag and leather polish. Grab some Rit dye from the laundry section at Target or Walmart and make those black jeans black again. Invest in some new heel tips for your worn-out high heels instead of buying a new pair. Your wardrobe just needs some TLC – it’s far from dead. If you’ve got a boyfriend, husband, brother or dad, ask them if you can dig through your wardrobe and try to snag some items they are no longer using (or borrow if they trust you enough!). I frequently dig through Jun’s wardrobe and grab items he no longer uses that are the missing key to tons of outfit ideas. Oversized white button-up dress shirts, oversized pullover hoodies, oversized bomber jackets, oversized watches – well, you get it: if you want something oversized or menswear-inspired, check out the nearest man’s wardrobe available to you. I know, you’re scared to try new things. But what if I told you new things were good? I mean, fashion is all about being creative and expressing yourself, so why not try new styles you don’t normally do? I don’t like to consider my style unilateral as I love creating outfits based on my mood – from athleisure and sporty to upscale and classy, my style spectrum is pretty wide, which allows me to utilize every single garment that’s in my closet. Look at your favorite celebrities and bloggers and try out some outfits inspired by them featuring pieces in your current wardrobe – you’ll have a lot of fun doing this, I guarantee you! Are you going to try some of these tips? Let me know in the comments and don’t forget to subscribe to my newsletter below to get more fashion tips and tricks delivered to you by email. I love the closet hangers and used them to assist in my recent closet makeover. Thank you so much for this post and for all you do to help us fashionistas look great on a budget. Yes girl! Loved your IG post!